PUTRAJAYA, 22 Apr 2014 – All families with autistic children must be given access to quality, affordable health care and services to deal with the mental disorder. The prime minister’s wife Datin Seri Rosmah Mansor said such a strategy must include input from researchers, policymakers, educators and caregivers to cover a wide range of issues, including training of skilled personnel such as psychiatrists, psychologists, paediatricians, therapists and early interventionists. Speaking at the International Seminar On Autism Malaysia 2014 organised by The National University of Malaysia (UKM) and Autism Speaks here today, Rosmah said educators and doctors need to learn, understand, practise and share intervention approaches that will enable individuals with autism to best cope with their condition. Rosmah is the patron of the seminar which was opened by Prime Minister Datuk Seri Najib Tun Razak. She said parents of children with autism must be empowered to encourage their afflicted children to achieve their fullest potential. The rates of prevalence of autism reported in developing countries could be due to ignorance or lack of awareness while such rate in Europe and the United States is currently just 1% of the population. Researchers found that more than one in three adults having Autism Spectrum Disorder (ASD) have no opportunity to further their education or being employed for the first six years after high school. Deputy Prime Minister Tan Sri Muhyiddin Yassin who is also the Education Minister and wife Datin Seri Noorainee Abdul Rahman were present. 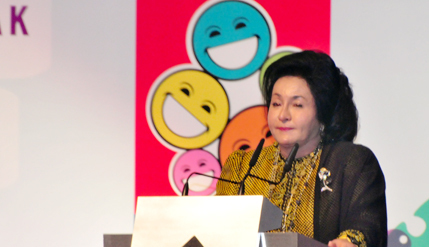 Rosmah said the seminar was designed to include topics ranging from the epidemiology of autism, service provision, early detection and diagnosis, state-of-the-art intervention as well as best practices in public health for ASD. The two-day seminar themed ‘Autism is not a Tragedy, Ignorance is’ comes under the ambit of the Permata Programme of which Datin Seri Rosmah is a patron. She expressed her gratitude to the First Ladies of Sudan, Sri Lanka, Kyrgyz Republic, Albania and Morocco for taking time to attend the seminar and share their experiences on autism in a special slot called “Voices of First Ladies”.